Howdy Salem Scuba Divers and friends! I’m so excited to announce that the 6th annual Blackbeards trip is a GO!! 995 (plus 125 in fee’s) for a week aboard the 65 foot Sea Explorer (or Morning Star). From October 5-11th 2019, you could be sailing the sea’s with 18 of our closest friends or making new ones! The price includes all diving, food, adult beverages. Truly one of my favourite parts of this trip is the pay-and-forget-it mentality. Once you’re on the boat, you won’t need to pull out your wallet except at the end of the week to tip the amazing crew that take excellent care of us each and every year. 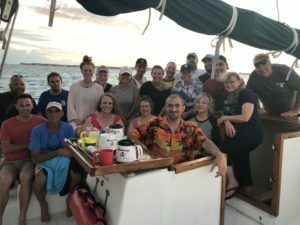 This is one of the least expensive live-aboard dive trips anywhere in the world, and an excellent way to get in some international scuba travel without breaking the bank. No matter if you’ve never done a dive trip before, or if you’re a seasoned scuba traveler, this trip will have something for everyone. From wall dives, swimthroughs, a drift dive called the washing machine (for good reason), a shark dive, reef dives- if you’ll be content anywhere, this array of diving and variety will leave you overwhelmed with the experience. Round trip airfare to meet us on the island is generally between 500-600, and many choose to stay on the island an extra day or two because island life in the Bahamas is both fun and extremely affordable. As well, the extra island time allows you to board the boat well rested and ready for the trip of a lifetime! Last years group had a blast! Payments can be made here: https://cash.me/$jimmynemo2 or using the square/cash app (that way no fee’s come out and nothing gets lost in the mail). We’ll be diving in the stunningly beautiful Bahamian Islands. Water temp’s in the mid 80’s, vis of 150 feet plus (easily), rum, wine, and beer on tap (and included in the trip price! ), plus hanging out with a group of fun divers, for a week of sailing on a 65 foot boat we like to call home, but technically it’s called the Morning Star. Last year, temperatures topside ranged from 78-85 (overnight lows and daytime highs), while water temp ranged from 80-84 degrees (No drysuits here!) You’ll be diving in around 6-12 pounds, instead of the normal 40+, and the diving there is easy, relaxing and so filled with life it’s hard to communicate it. I would absolutely love to have you with us, and as my grandfather used to say- “It’s the trip of a lifetime, every time we go!” So join me, and I can’t wait to go diving with you!